Bedroom, 5 Bathroom Beauty Listed at $1,789,000. Listed $100,000 BELOW Appraisal. Owner very motivated. 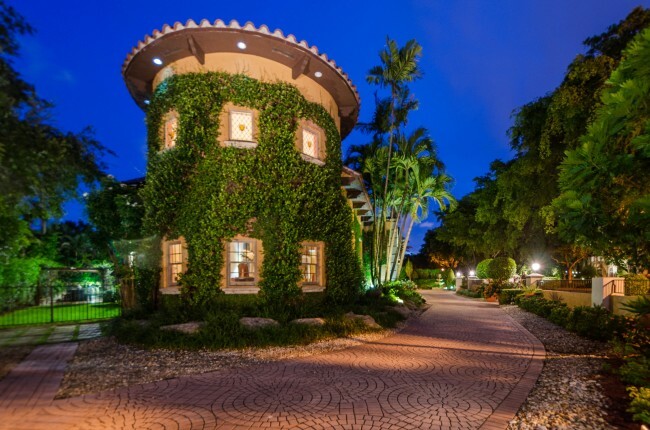 Located just across the Granada Golf Course in central Coral Gables, this spectacular Mediterranean Villa has 5 bedrooms and 5 bathrooms and was designed by architect Ramon Pacheco. The home has high vaulted ceilings, a grand stairway, and an inner courtyard with a pool. 2505 De Soto Blvd is gated and its exterior is characterized by its ivy covered walls and lush landscape. Within the gates is a very detailed brick paved driveway leading up to the main doors of the home. The main living area has 22 foot ceilings and has a several stylish chandeliers. The music room built in the tower has very high ceilings and the rooms circular design provides for excellent acoustics. The formal dining area is very large at 23 feet long, allowing for great entertaining. To see all homes on the market Coral Gables in your criteria, please click here for our search page. The family room is in the center of the home. It has a very detailed built-in wall unit and a wet bar that includes a wine cooler and wine rack. This is a very bright space, as the wall is lined with double doors leading out to the inner courtyard of the home. The adjacent kitchen is completely updated and has a large breakfast area. Dark cherry wood cabinets, a Subzero refrigerator, and spacious granite counter tops detail this room. Arched Double doors look out to interior courtyard and pool. Four of the five bedrooms are located on the first floor, with the master being the only room upstairs, allowing for privacy. The rooms are all very spacious, one currently being used as an office. Another is completely handicap accessible, including the bathroom within the room. The largest downstairs room has wall to wall closets and can be used as a second master bedroom. The staircase will lead you to the sitting area just outside of the master bedroom on the second floor. The room is characterized by its high 17 foot Cyprus wood ceiling, checkered marble floor, and balcony that overlooks the interior courtyard. There are his-and- her, cedar lined walk-in closets, a gorgeous roman tub and exquisite vanity. The inner courtyard of the home has a swimming pool, built-in bar and cabana bathroom. Here, you can continue to see the Mediterranean details of the home, including the patio with trellis and brand new clay barrel tile roof. It is perfect for entertaining because the outdoor space is central to the home and it has plenty of tall trees for privacy. Within the full two car garage, there is a separate area with two bonus rooms, which can be used for an office, gym, or maids quarters. There is a side yard with lots of space for a boat. Also, the roof is brand new, built in January of 2013. 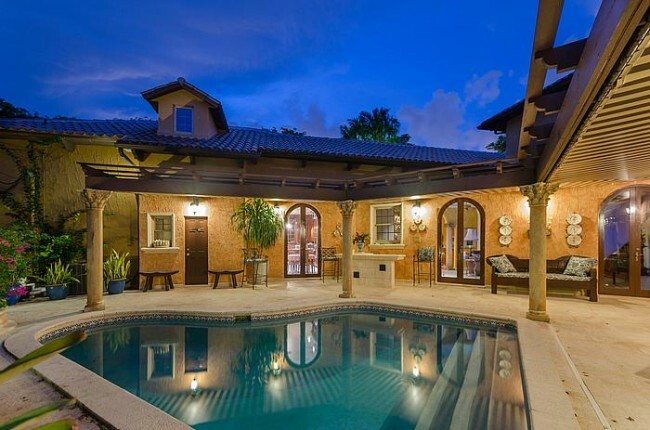 This beautiful home is located within minutes from Downtown Coral Gables, which has an abundance of dining, shopping, and some of the top golf courses. For a private showing this home or any home currently for sale in the Coral Gables area, please contact Oscar Arellano at 305-525-7324 or simply click here for our contact page.